Shoja, the most beautiful offbeat destination in Himachal Pradesh is located 69 KMs from Kullu at an altitude of 2692 mitre from the sea level. If you want to get immersed in the wild nature of thickly wooded forests, burbling streams, gushing rivers and wildflowers, Shoja is your ideal place. The unspoiled beauty of this pristine village makes it fast upcoming tourist destination of Himachal. 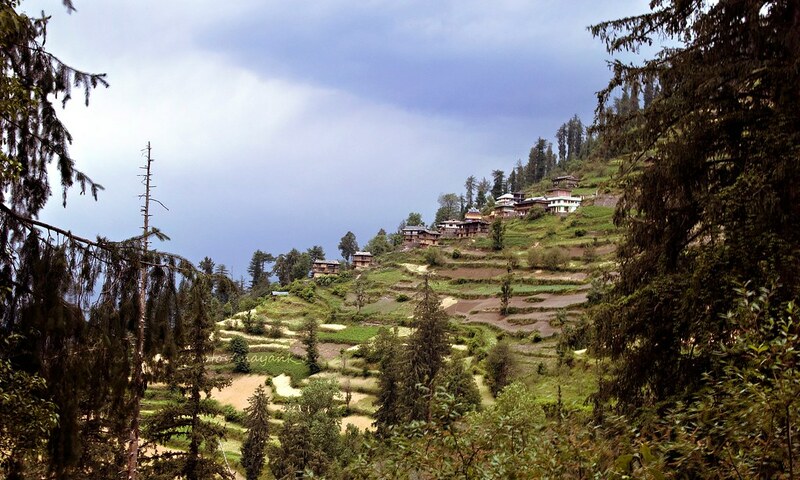 This little hamlet, located in Seraj Valley, links the Shimla and Kullu districts. Shoja village is still off the beaten path for most, which probably explains its virgin beauty. Nearest Railway Station: Shimla and Chandigarh. If you want to come by bus, you can take a bus from ISBT from Shimla/Chandigarh for Bhuntar. You have to hop down at Aut from where you can get the cabs for Shoja. If you pre-book your homestay, the homestay owner will send you the cab for pick up at the cost 500Rs. The road condition is bad, but the bad roads always end in a good place. Hotel is not available here. You have to take homestay for staying, which are very few in number. You need to book it earlier because; those are almost full in season. One of the great options for staying is Banjara Retreats property (011-26855152, banjaracamps.com). As soon as you reach, the charming and peaceful village and its pristine environs and Himalayan surrounds are likely to leave you speechless. With sloping mountains covered in verdure, conifers and deodars stretching for miles around, and an incredible view of the snow-covered peaks make it breathtaking spot. It is the place to enjoy nature from different angles. The place is very silent. A few families live here. So, don’t expect more modern amenities from the villagers of this unspoiled hill-top village. If you want to go so for sightseeing, the homestay owner will provide the car. It is a nature paradise, located 5 Km away from this village. It is at an elevation of 10280 ft from sea level. We visited it in April when all over the pass covered with the snow.The view of snow-covered mountain and pass is amazing. That time, we couldn’t able to visit the Rohtang Pass of Manali. 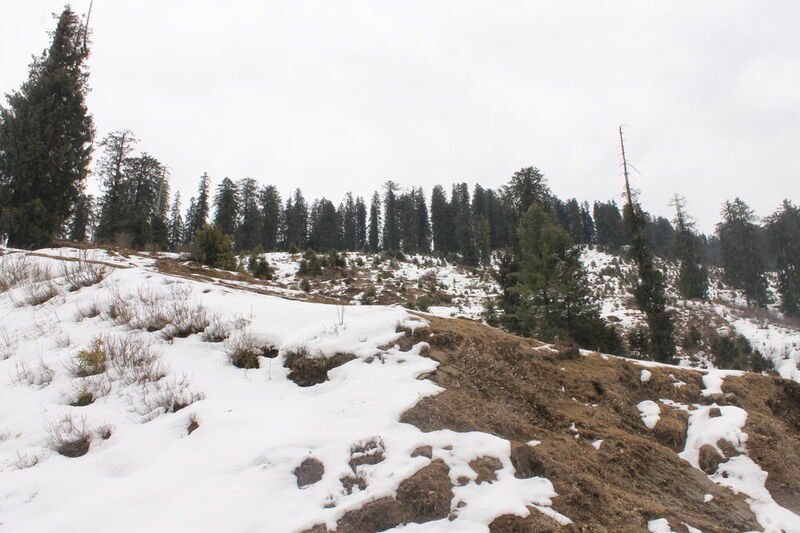 But, we have no regret for that as we were already mesmerised with the awe-inspiring view of Jalori pass. The waterfall is not very special. There is an arrangement of sitting on the chair and table, which are made by the tree trunks. There was a fort, named as Raghupur fort, which we couldn’t visit. But, the fort is good for tourist to hang out. If you want to avoid crowd or escape from the hectic schedule of daily life by spending a relaxing weekend or few days in the silence of Himalaya, it is the best place for you. We visited Shoja on our way to Kulu from Shimla in our Himachal Trip. That time, Shoja was not so popular destination for tourist. Hence, we preferred to stay at Kulu and visited this place by a recommendation of our relative. But, now, the condition is changed and it becomes a popular tourist spot. Many tourists and travellers prefer to stay at Shoja instead of Manali as Manali is overcrowded now. It happens. We are more interested to know the places which are far from us and oftem miss the beauty of the nearby places. You can google it to get your required info. Now, Shoja is quite popular offbeat tourist destination and still pristine. It’s obvious that you couldn’t get all the modern amanities and coommunication facilities that other common tourist place provides. Thank you Shweta for sharing your thoughts. Thank you so much, Sayan. Never heard about this place, its really an amazing one to explore the nature’s beauty. Thanks for sharing with beautiful captures. My pleasure. Thank you too Jyotirmoy for sharing your thoughts.